My family uses this very simple recipe to make vegan Mac 'n' Cheese, Lasagna and Quiche. And you have a yummy sauce that can be used in so many ways! A family favourite! Delicious on spaghetti, rice or pasta. You could also make Chickpea balls by replacing the lentils in this recipe for chickpeas. Drain Lentils through a sieve and rinse with water. Add to a bowl and crush with either a fork or your hand. Add Cumin and Curry Powder, mix well. Roll into balls. The smaller they are, the quicker they cook. Heat oil in a frying pan on a low to medium heat, then add the balls. Once mostly cooked (open one up to see if it's cooked through) increase heat so the balls brown. Once browned, add pasta sauce and cook for a further 3 – 5 minutes. Serve on spaghetti, fettucine, rice or pasta with some veggies on the side. Time to cook: Depends on the size of the balls, usually around 15 minutes. A very simple and delicious recipe! 2. Blend the chickpeas with approx. 1 cup water until it makes a smooth, creamy paste. 3. Place the Macaroni in an oven-proof dish, mix in the chickpea paste. 4. Blend the bread until it's ground up into fine bread crumbs. Add salt and oregano, mix together. 5. Sprinkle the bread crumb mix on top of the macaroni. 6. Cook at 180 degrees celcius for about 15 minutes, or until it's nice and brown on top. 7. Serve with boiled veggies. Enjoy! Cook the rice normally, mixing in the sugar and vinegar when it's done. Leave to cool. On a table, cut the carrot, cucumber and advocado into fine strips. Get a sheet of seaweed paper. With a tablespoon, cover the bottom half of it with rice. If it gets too sticky, you can dip the spoon in water and flatten it down. Place the carrot, cucumber and avocado strips in the center of the rice, in a straight line. Gently roll the sushi up. Just before you come to the end, wet along the end of the seaweed paper make it stick. Once it's all rolled up, cut into pieces with a razor knife, or leave whole and eat like a burrito! 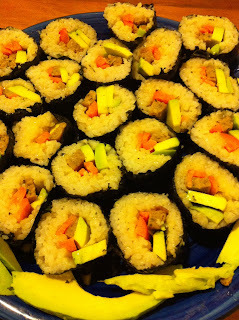 This is an example of the typical sushi we have - but you can put whatever you like in them! In the photo above, I added vegan sausage. I also sometimes like to add tomato or lettuce. The choice is up to you! What does Peaceful Abolitionist mean? Like Abolitionists in the past campaigning for the end of human slavery, I am working to end nonhuman slavery. Other animals are viewed as "things" for humans to use however we like, but just like us, they are persons who value their lives and deserve the one basic right to not be the property of another. We breed and kill trillions and trillions of animals every year for food, clothing and other uses. Each and every one of those animals was an individual who didn't want to die. When we buy animal products, we are supporting terribly violent and unjust industries. But we don't have to. We can opt out of this violence and go vegan. Vegans don't participate in the use of animals for food, clothing, entertainment, or any other purpose. It's easier than you think. Please feel free to email me -info[at]peacefulabolitionist.com - if you have any questions or need any help or support going vegan. If you can, please donate to Peaceful Prairie so that they can continue their wonderful work for nonhuman animals. My name is Emmy and I'm an Abolitionist Vegan from New Zealand, speaking out against violence towards all animals - human and non.